Loving mother, dedicated Christian and avid member of the community, Gail Patrick Reed was born to the large family of David Caple and Ada Caldwell-Caple in Shelby, Tennessee on February 04, 1936. Later, after marrying Robert Reed, she gave birth to John Reed and eventually moved to Milwaukee, Wisconsin in 1969 to continue an already long and dedicated teaching career with the Milwaukee Public Schools System. (A total career which lasted for OVER thirty years.) Upon meeting numerous friends and taking on many community efforts (which were her subsequent hobbies), she has enthusiastically and open-heartedly left her mark in Marquis Who�s Who In Education, civil projects and MANY public endeavors. 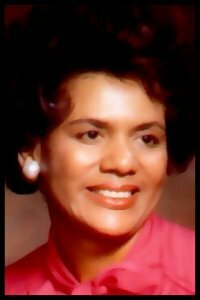 After courageously enduring cancer, she died on June 29, 2005 in Milwaukee, Wisconsin and is survived by her sister, G. Mason; her son, J. Reed; and her nieces, nephews and relatives including J. Cargile, E. James, L. James, R. James, M. Mason, J. Mottley and many others. Gail Patrick Reed will ALWAYS be loved by everyone who has met her as she is an inspiration of commitment and caring to us all. "With Love To My Mother..."